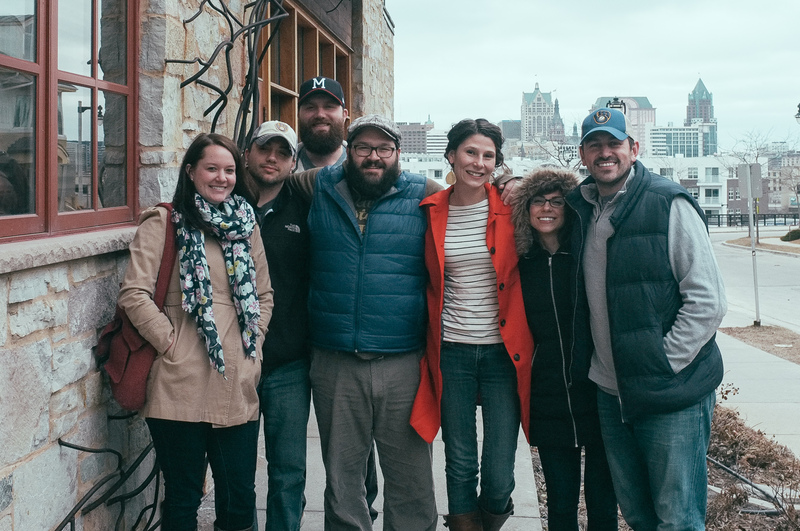 Nothing could quite hit the spot after our morning tour of Lakefront Brewery (read about it here) than a great brunch, so we were counting on our “W” restaurant, Wolf Peach, to deliver. The brewery tour served as a nice way to go buzzing straight into lunch. The first thing I noticed walking into Wolf Peach was the excellent view of the city. The restaurant sits perched on Brewer’s Hill and the entire back wall is a floor-to-ceiling window looking over the city. It also has a raised patio that I’m guessing seats people come spring and summer. 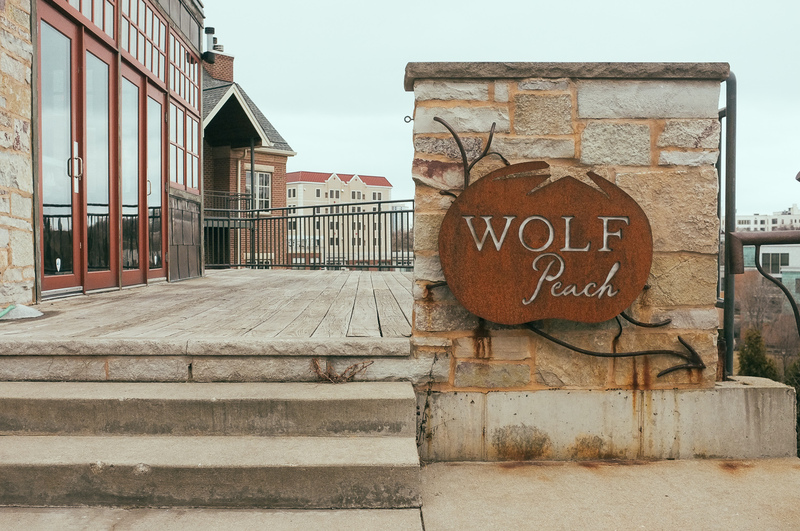 You almost exclusively see downtown from the Lake, but the view from Wolf Peach, atop a bluff above the Milwaukee River, highlights the city and its iconic buildings from a more impactful vantage point. 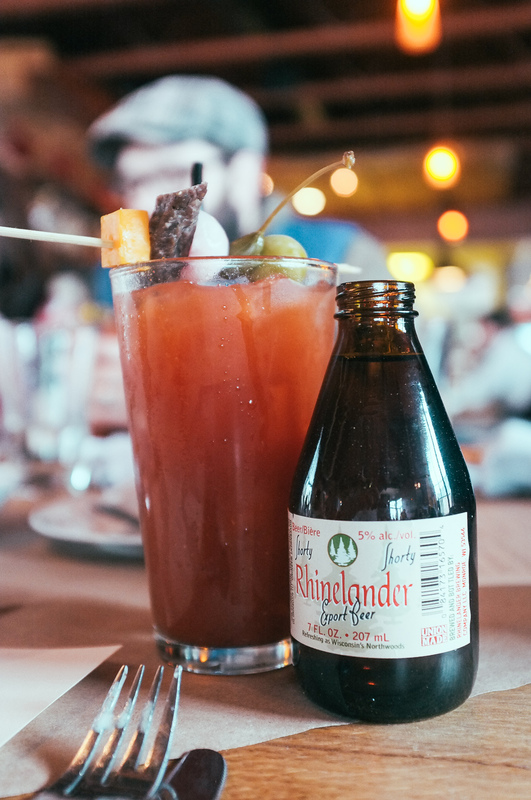 The place is small, rustic and was lively and packed throughout our brunch. Our spot was in the middle of the dining room, at a tall table–it seems like no space is wasted–the aisles are tiny and tables seem to take up every possible other inch. Reservations were necessary. I loved the orange cinnamon roll. 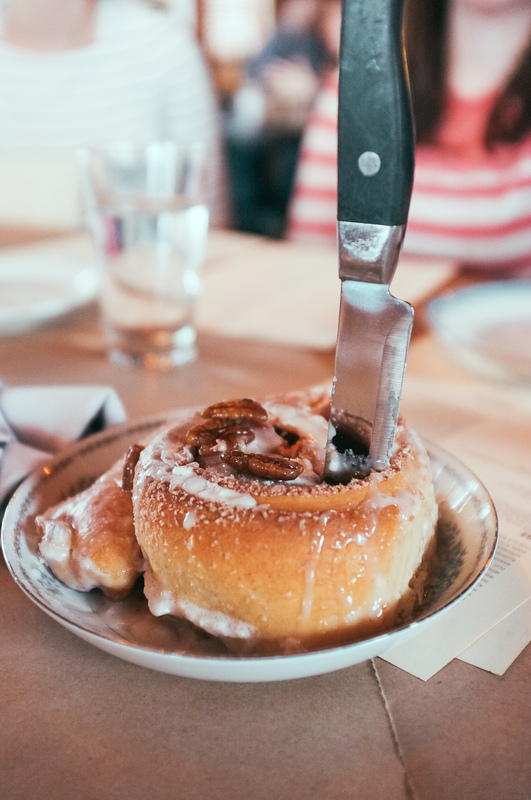 However, I’m a sucker for cinnamon rolls in general. I think they give this to everyone as my friend and I got a free one our last visit, too. I really liked the bloody – a no frills, spicy, tomatoey homemade mix with excellent garish … pickled onions and capers? Oh my! It was very mimosa-y and I couldn’t taste much of the grapefruit juice. I’ve never had a grapefruit mimosa so I don’t have anything to compare this too. I love grapefruit juice and I’d order one again. Wolf Peach promises food “Como Viene,” fresh and ready to enjoy. Our food was reflective of this… it came out rather quickly, which pleased us all. 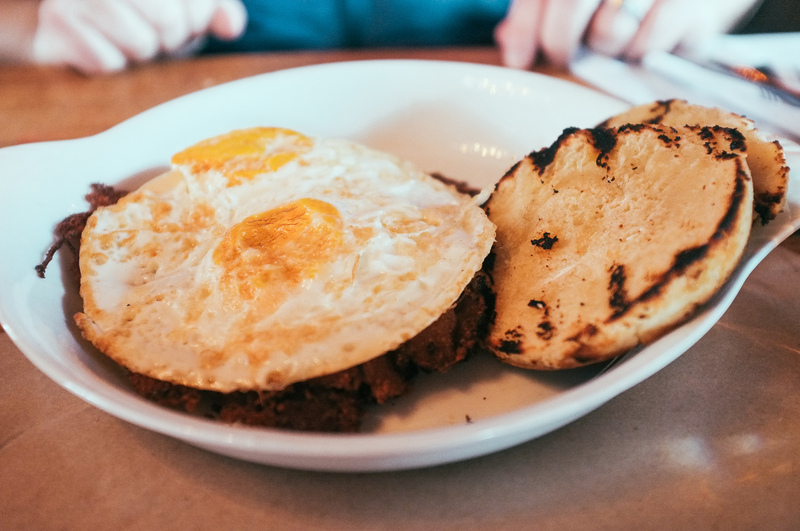 I ordered the corned beef hash, with overhard eggs, and it came with an english muffin. The hash was interesting, it almost tasted fried, and it was cooked all together almost in the form of a pancake, with the eggs atop it. The corned beef had a nice, but not standout, flavor and was mixed evenly throughout the dish. They also brought over their house jelly for the english muffin and it was very tasty. It was very, very good. The eggs were cooked perfect. The english muffin was better than any I have ever had. The only thing that wasn’t to my liking was the chorizo. It was cut up much too small, almost like scraps of hamburger – when I would have preferred bigger pieces. The latkes had the perfect crunch. I ordered the I’ll Have What She’s Having, which was the chef’s choice of eggs benedict. It had no meat, but had tomatoes. I liked how it tasted! Looking back, I think it’s odd there was no meat. I was not a huge fan of the latkes but they were interesting. 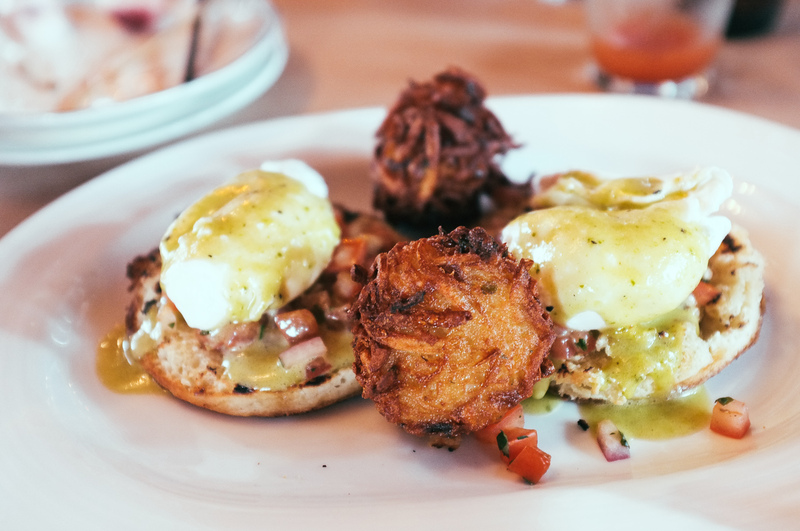 It was eggs benedict, house-made canadian bacon, hollandaise, english muffin, two poached eggs and potato latkes. It was very traditional and good. I liked it a lot. I’ve had their brunch twice now and I liked both dishes I’ve had. My meal was good but oddly very, very under salted. Adding a healthy amount of salt brought the flavors out and I was very satisfied. I did enjoy the other things I got to try, especially Cindi’s polenta. 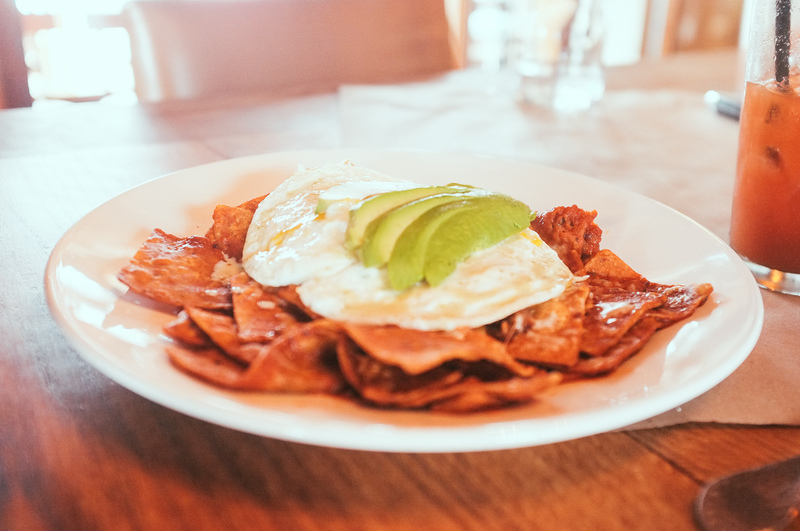 It is is chorizo, chilaquiles, cilantro crema, avocado and two over easy eggs over tortilla chips. The taste combination was great but I was not a fan of the soggy chips … which was most of them since the toppings covered most of the dish. I preferred to grab a crisp chip from the outside and scoop the other stuff up with it. I later learned that this is just how the dish is served, so it’s just personal preference that I wasn’t a fan of the soft tortilla chips. 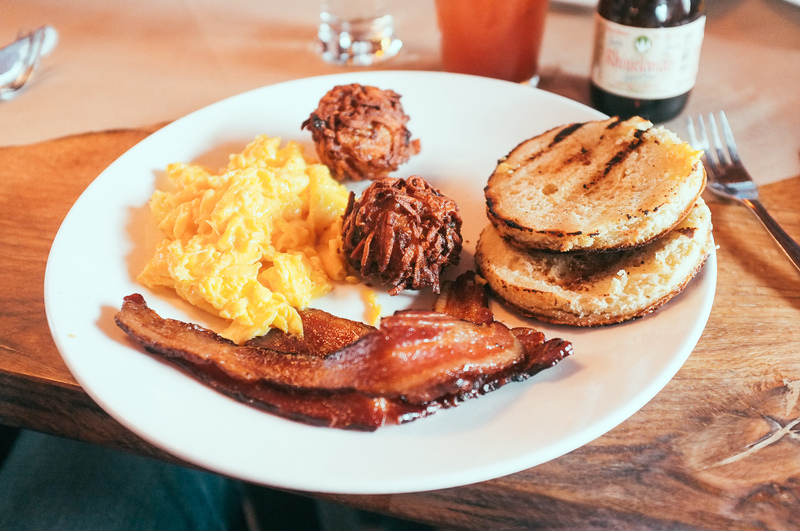 I had the three eggs any way, potato latkes, bacon and house-made english muffin. 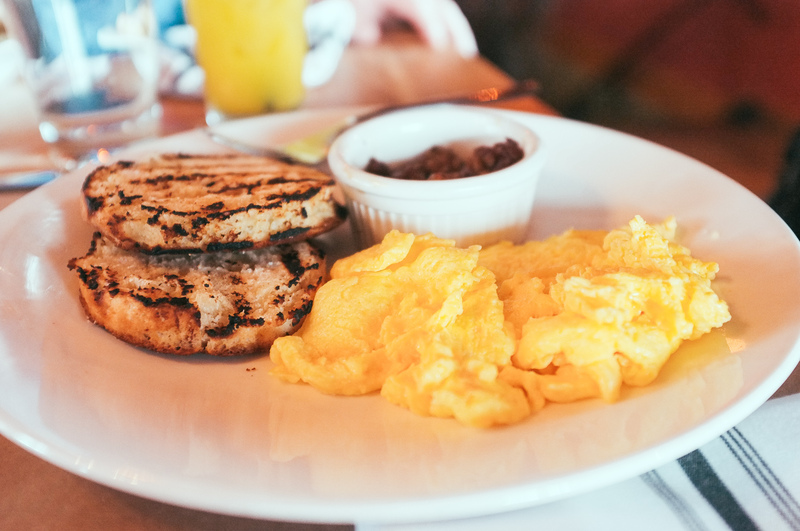 I ordered the eggs scrambled leaning towards “easy” and they were done perfectly. Having eaten the cinnamon roll earlier, I think we were all fine without have any kind of dessert, but we all did really enjoy Wolf Peach. The food was priced at around $10 to $12 per plate, and drinks were also moderately priced. 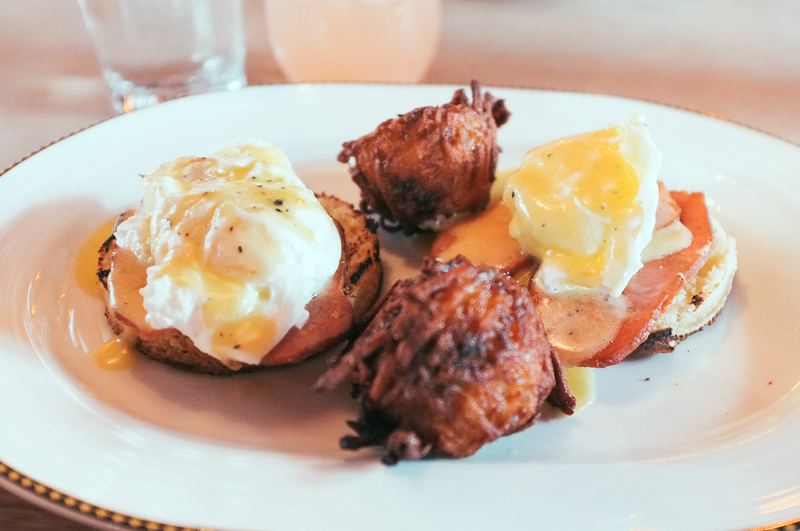 I really liked our brunch at Wolf Peach. The atmosphere was really nice without being stuffy. I’d recommend Wolf Peach to anyone look for a comfortable but impressive place. I’d imagine the patio during summer is wonderful with the view. I had a lot of fun at Wolf Peach, even if the meal wasn’t my favorite thing that I’ve had during this project. The morning and afternoon served as a nice reminder of some of the cooler things Milwaukee has to offer. Guys, take your ladies here on a quiet summer night. Sit outside, talk, look at the city and enjoy some cocktails. I plan on taking my own advice in the coming months. Visit Wolf Peach online here. Losing nominations for ‘W’ were: Wasabi (Mike) and Water Buffalo (Adam). 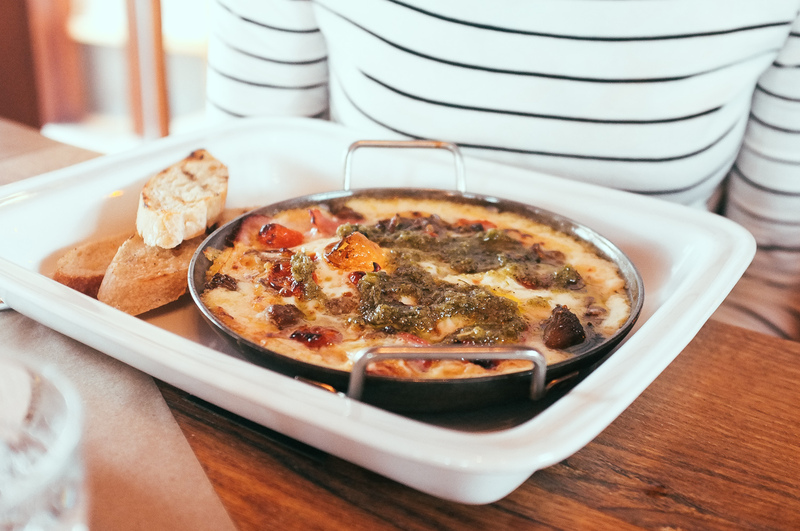 WHERE ARE WE EATING NEXT? 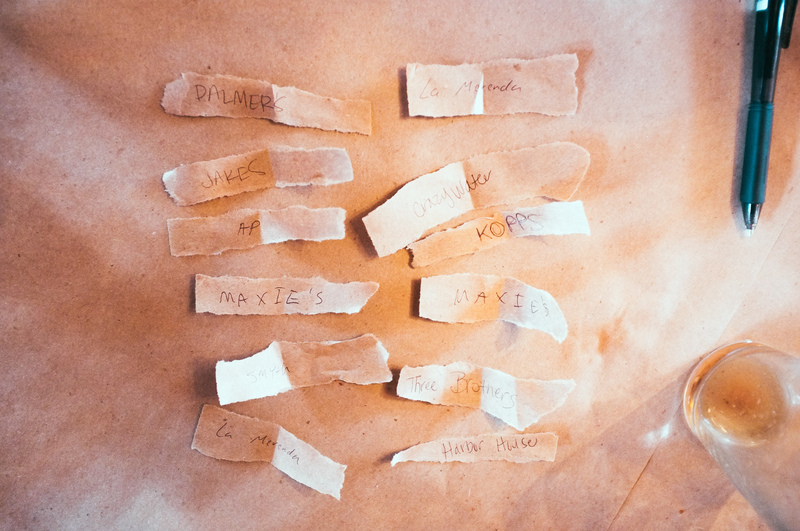 Since there are no ‘X’ restaurants in Milwaukee, we decided to do a wildcard round for our next restaurant.